Liczba stron: 1017 Jest to ujednolicona liczba stron, która ułatwi Ci porównanie długości książek. Każda strona Legimi to 200 słów. Dr. Marco Conci, psychiatrist and psychoanalyst, active in the international psychoanalytic community and inhabiting three linguistic and cultural environments (Italian, German, and American), has given us a definitive book on the life and work of Harry Stack Sullivan, the founder of interpersonal psychiatry and psychoanalysis in the United States and other countries. Sullivan continues to animate the interpersonal therapies of psychiatrists and analysts of various schools. In this richly detailed, fascinating and highly readable narrative Dr. Conci combines the passion of a historian with the compassion of a humanistic practitioner of psychiatry and psychotherapy. He also brings us a much needed moral message: to restore the tradition of psychological help to the suffering soul of mankind, an antidote the current medicalization of psychiatry world-wide (Zvi Lothane, M.D., Clinical Professor of Psychiatry, Mount Sinai School of Medicine – New York, USA).This is a remarkably comprehensive study of Sullivan’s milieu, teaching and influence, in the course of which we are treated to nothing less than an ambitious, new perspective on the early history and recent developments of American psychoanalysis. It is, moreover, the unique and valuable perspective of someone who has lived both in America and abroad, and has both the insider’s easy familiarity and the outsider’s objective eye. It is at once an illuminating study in American intellectual tradition, a detailed study of Sullivan’s teaching as understood by an experienced and open-minded clinician, an informative survey of his relationships with other analysts, and a vision of his heritage in the contemporary relational school. It is hard to imagine an analytic reader of any stripe who will not find illumination in areas of special interest, and unexpected profit in areas previously neglected (Lawrence Friedman, M.D., Clinical Professor of Psychiatry, Weill Medical College of Cornell University – New York, USA). Since the publication of the First Edition of this book two years ago, I experienced a growing interest in my work. The first journal to review it was ThePsychoanalytic Quarterly, through Aaron H. Esman. His appreciation of my work of reconstruction and revisitation of Harry Stack Sullivan’s life and work emerges from the way in which he concludes his review, i. e.: “Sullivan’s true legacy is the increasingly diversified character of contemporary psychoanalysis and dynamic psychiatry, and their openness to, even acceptance of, varying theoretical perspectives and alternative technical approaches to the understanding and treatment of a wide range of emotional and mental disorders” (2011, p. 1088). A similar appreciation came from the historian Naoko Wake, the author of the book Private Practices. Harry Stack Sullivan, the Science of Homosexuality and American Liberalism (2011), through the review she published in the journal History of Psychiatry, which begins with the following words: “For those of us who look for clinical wisdom in psychiatry, Harry Stack Sullivan (1892-1949), the founder of the interpersonal theory of mental illness in the USA, never seems to fail. His words are unique, if not easily understandable, and they urge curious minds among us to speak through them” (2012, p. 252). Even more insightful into and sympathetic with the character of my project was the review published last summer in the Journal of the American Psychoanalytic Association by the colleague Jane G. Tillman, who writes: “Conci’s project is clearly one of love and devotion to his subject. Perhaps it takes an analyst from afar to bring us fresh news about the ongoing relevance of one of our own” (2012, p. 615). And here is how she concludes her review: “Overall, Conci has given our field a carefully planned and written history of one of North America’s most important psychoanalytic pioneers” (ibidem, p. 618). Right now further reviews of the book are being prepared for the following journals: The Psychoanalytic Review, Contemporary Psychoanalysis, The American Journal of Psychoanalysis, Psychodynamic Psychiatry and Psychosis. If the English-language publisher who was supposed to publish this book finally gave up the project, out of fear that such an intellectual biography would not sell well enough, the Mexican publisher Amparo Espinosa Rugarcia developed such an interest in this book that she was able not only to find a very good translator for it (Manuel Villalaz), but also to complete the whole publication process in less than a year. On October 12, 2012 I was able to present the Spanish-language edition of this book – entitled Descubriendo a Sullivan. Vida y obra de Harry Stack Sullivan y su relevancia para la psiquiatría, la psicoterapia y el psicoanálisis contemporáneos – at the XVII Forum of the International Federation of Psychoanalytic Societies held in Mexico City – with the help not only of the publisher and the translator, but also of my dear colleague Sandra Buechler. Donnel Stern – who would have been happy to welcome my book in the book series he coordinates for Routledge – wrote for it the Preface which I am including in this book. Furthermore, I know of some interest in the book in Japan, where six out of the seven books published by Sullivan in the USA have been translated – one more than in Italy. But the person to whom I feel most grateful is my old friend and colleague Marco Bacciagaluppi, who made possible this Second Revised Edition through the careful and systematic work of linguistic revision of the First Edition which he performed for me – out of pure friendship and interest for my work. As I wrote in the Foreword of his book Paradigms in Psychoanalysis. An Integration, he has been one of the pioneers of the Italian receptionof Interpersonal Psychiatry and Psychoanalysis and as such he accompanied and participated in the development of my work since 1990. His intellectual generosity reminds me of the attitude which Stephen Mitchell showed towards my work and professional development since our first meeting in 1988 – and until his untimely death 12 years ago. A similarly enriching dialogue is also that which I was able to experience over more than two decades with Zvi Lothane, since our first meeting in Stockholm in 1991. Through a whole series of very original and stimulating papers, Zvi kept building bridges between Sullivan and Freud as no one else has done in our field – see for example the papers “The uses of humor in life, neurosis and psychotherapy”, and “Dramatology in life, disorder and psychoanalytic therapy: A further contribution to interpersonal psychoanalysis”, both published in the International Forum of Psychoanalysis, in which he also published (2002) the first English review of this book. I am of course very grateful also to my publisher Michelangelo Sebastiani and his collaborator Antonella Weber, who made this new Revised Edition possible, and through it the circulation of the book not only in paper form, but also as ebook. This project started more than twenty years ago with a seminar on Sullivan’s interdisciplinary perspective which I gave at the University of Venice in 1988, followed by my initial meeting with Stephen Mitchell during his first trip to Italy in April 1988. He was also fond of Sullivan and appreciated my enthusiasm for his work. It was on account of my conversations with him that the fantasy of writing a book on Sullivan became a reality through hard yet fascinating work. Because of the complexities of putting this book together, I have decided to include my Introduction to the original Italian edition published in 2000 which also appeared in the 2005 German edition. The Introduction from 2005 has once again been updated, but its original frame and form have been maintained. For the project to take shape many ingredients had to be combined, including the literature I collected and the colleagues with whom I came in touch over the years. If my original motivation consisted in showing the contemporary relevance of Sullivan’s dynamic psychiatry, my interest in the relevance of his contribution to contemporary psychotherapy and psychoanalysis has grown in parallel with my own professional development. This is similar to how Sullivan was experienced by one of my teachers, Gaetano Benedetti, whose Preface to the German edition I have also included in this edition. In his review of the original Italian edition in the International Journal of Psychoanalysis (2009, pp. 1200-1201), Marco Armellini does not fail to mention the influence which interpersonal psychoanalysis and relational psychoanalysis have exercised on the newest developments within Italian psychoanalysis, especially on authors such as Stefano Bolognini, Vincenzo Bonaminio, Franco Borgogno, Antonino Ferro and Anna Ferruta. Indeed, not only did I have the good luck of getting to know Stephen Mitchell over many years (and of organizing his two subsequent trips to Italy in 1991 and 1996), but I was also able to contribute to the publication in Italy of all his books. Also included in this chapter of my professional life is the proposal I made a couple of years ago for the White Institute to host Antonino Ferro for a day of scientific and clinical exchange. With Sandra Buechler and Seth Aronson’s help, it was possible to organize just such an event on January 16, 2010. Sullivan was a pioneer in the clinical use of the field concept which is also so important in Ferro’s clinical work: how do they differ, and what do they have in common? In a paper published last year entitled “Bion and Sullivan: An Enlightening Comparison”, I tried to show what these two pioneers of contemporary psychoanalysis had in common. One of the reasons a book on Sullivan’s life and work can still be of great interest is that only through familiarity with the contributions of a whole series of authors can we keep alive the hope of developing the “scientific discourse” our profession needs; this is required if we are to try to adequately help our patients. This point of view originally moved Jay Greenberg and Stephen Mitchell to write Object Relations in Psychoanalytic Theory, a book which changed our way of working and of training candidates. In order to best practice our profession, we need to take into consideration as many points of view as possible from both a scientific and a clinical perspective. I agree with Henry Smith that “if we could examine clinical work more closely, we might find a convergence of clinical approaches despite the disparate theoretical positions that analysts use to explain them” (2007, p. 1758). I also agree with Arnold Golderg’s opinion in the same supplement issue of Psychoanalytic Quarterly: “It should be clear thatpsychoanalysis has thus far been unsuccessful in answering the question of what works best for which patient. I cannot imagine how it will ever be successful in such a pursuit as long as we are prisoners of our parochialism” (2007, p. 1671). We must also note that Sullivan’s original perspective not only contributed to the genesis of interpersonal and relational psychoanalysis, but also inspired the scientific work of entire generations of researchers including, for example, Daniel Stern, Robert Emde and Vittorio Gallese. Writing in a recent issue of Psychoanalytic Dialogues in a special section on “Anchoring intersubjective models in recent advances in developmental psychology, cognitive neuroscience and parenting studies”, Massimo Ammaniti claims: “The roots of this paradigm can be traced back to George Herbert Mead in the field of psychology… and to Sullivan in psychoanalysis” (2009, p. 585). The very same phenomenon of “embodied simulation” which Gallese essentially defines as “a way of characterizing our direct understanding of others” (2009, p. 583) can easily be linked with Sullivan’s “theorem of anxiety”, that is, “The tension of anxiety, when present in the mothering one, induces anxiety in the infant”, a theorem formulated by Sullivan in the mid-1940s and published in his Interpersonal Theory of Psychiatry (1953, p. 41). And now let me provide my readers with a very personal key to this book: as an exchange student in a suburb of New York City in 1972-1973, I had the chance to learn the virtues of American pragmatism, openness and elasticity, and to look critically at the limits of my classical European education which emphasized independence of mind at the cost, for example, of practical autonomy. The lesson I learned then was to keep looking for the possibility of dialogue and integration between European and American cultures. In fact, the interpersonal point of view itself (as developed by Sullivan and Thompson, Fromm and Fromm-Reichmann) was the result of a similar attempt at integration. Of course, as a historian of psychoanalysis I also know that – from the point of view I am deploying – Freud’s new discipline was also the result of his capacity to integrate at least two traditions: the Austrian medical and the French psychological. In other words, the reader can be sure that this book is built upon a great deal of research into dialogue and integration between the two poles of European thoroughness and American openness. A final point of view can be the following: the psycho-pharmacological advances of the last few decades have put more therapeutic instruments at the disposal of our patients, but have ended up “killing” psychiatry as a discipline in the way Meyer, White and Sullivan thought of it and lived it, which is to say as an intellectually stimulating discipline, an attempt to find a new interdisciplinary synthesis of the biological, psychological and social variables which determine human life and illness. From this point of view, the interpersonal tradition did and does really share the same point of view as Bion: what we need are not answers but questions! The same attitude should, of course, also inspire our work as psychoanalysts: psychoanalysis as an open and continuous dialogical inquiry in the context of the transference which patient and analyst mutually, unconsciously develop, and its always laborious elaboration. Marco Conci has already earned a name for himself in Italy and elsewhere outside of Germany with his perceptive study of Sullivan, an excellent book which paints a portrait of this great pioneer of contemporary psychotherapy. In this book, he not only recapitulates the foundations of Sullivan’s theory, namely interpersonal psychiatry, but also his therapeutic work with psychotic patients. Indeed, much that is already known about Sullivan is presented anew by virtue of Marco Conci’s scholarship and multi-year investigation: the history of Sullivan’s reasoning; the phases of his development which took place in stages; and how these ran through his life thereby affecting the greatest psychiatric personality at that time. Viewing Sullivan’s thought through the mirror of his life is like finding a gem which perfectly fits an historical ring, a ring that fits the finger of today’s psychiatrist well, resulting in the transmission of the topicality of Sullivan’s psychiatry. Marco Conci enables us not only to learn from Sullivan, but also to see the psychiatric-historical and social-sociological dimensions of his time. The author’s thorough examination and his spiritual proximity to a pioneer about whom he cares so much combine to create an ideal biography. His style is never dogmatic precisely because instead of merely representing Sullivan’s point of view Conci does so via a comparative approach. A further merit of this book is that it does not limit itself to the past, but demonstrates the relevance of the past for the present, a demonstration which I could not have predicted when I first enthusiastically introduced Sullivan’s work in the 1960s in Italy. How has Sullivan’s work been continued by his successors? What modifications have they superimposed? And what influence did his work have on contemporary dynamic psychiatry, psychotherapy and psychoanalysis? Marco Conci offers us a fertile “reinterpretation” of Sullivan. He thus now makes available to the German reader a work which must be regarded as the standard in this field. I became acquainted with Marco Conci as part of his psychoanalytic training in the Milan Associazione di Studi Psicoanalitici (which has been part of the International Federation of Psychoanalytic Societies since 1989) and since then have become acquainted with his research abilities. He is an editorial board member of the International Forum of Psychoanalysis (Stockholm) and Psychoanalysis and History (London). This book is based upon research Marco Conci carried out over many years and thus includes the entire neo-Freudian development in psychoanalysis. Mymentorin graduate school had two intellectualand clinical heroes, Sigmund Freud and Harry Stack Sullivan. He admired them in equal measure, and taught me to do the same. And so when I applied for psychoanalytic training in the mid – 1970s, I found it perfectly natural to combine Sullivan and psychoanalysis. I was ready, in other words, for Interpersonal Psychoanalysis. That was a good thing, because I trained at the William Alanson White Institute in New York City, the very institute where Sullivan taught, and where he was one of the founders, along with Erich Fromm, Clara Thompson, Frieda Fromm-Reichmann, and Janet and David Rioch. White is the home of Interpersonal Psychoanalysis. It was then and is now. It trained and nurtured many or most of the best known of the first two generations of Interpersonal analysts: Joseph Barnett, Ralph Crowley, Arthur Feiner, John Fiscalini, Edgar Levenson, Ruth Moulton, Rose Spiegel, Erwin Singer, Edward Tauber, Benjamin Wolstein, and others. It is also the institute in which a number of the first-generation Relational psychoanalysts, most of whom also continue to consider themselves to be third-generation Interpersonalists, trained: Philip Bromberg, Darlene Ehrenberg, Emmanuel Ghent, Jay Greenberg, Stephen Mitchell, and me. All of these analysts, and many others, were inspired by the work of Sullivan. But Sullivan himself was not trained as a psychoanalyst, and did not wish to be considered one. He was unwilling to be identified with the mainstream Freudian psychoanalysis of his day. He was very clear on that point. He wanted to be considered a psychiatrist. He started his career enthusiastic about Freud’s psychoanalysis, as his first book (Sullivan, 1972), only published many years after his death, makes clear; but he soon felt otherwise. He could not accept instinct theory, the absolute centrality of the Oedipus complex, the transference neurosis and therapeutic regression, the structural theory, and much else. He believed that personality was shaped by one’s experience with others, and he focused his attention only on what could be observed. Sullivan’s colleagues and students, many of whom disagreed with the same points that bothered Sullivan, understood that Sullivan’s attitude toward psychoanalysis, while it prevented him from making contributions to the traditional psychoanalytic canon, was nevertheless terribly important to what psychoanalysis could become. Clara Thompson, bringing together Sullivan’s thinking with the work of Erich Fromm, a psychoanalyst trained at the Berlin Institute, was perhaps the first to expand Sullivan’s work into a variety of psychoanalysis, one based on interpersonal events. It was the editor of Thompson’s (1964) selected papers, Maurice Green, who, in casting about for a title for that volume, coined the term “Interpersonal Psychoanalysis” to describe Thompson’s contribution. And so Interpersonal Psychoanalysis came into being. Edgar Levenson, probably the most significant writer in this tradition, fulfilled Thompson’s dream of a new psychoanalytic vision, along with Benjamin Wolstein. Levenson’s formulation of the Interpersonal psychoanalytic perspective took place in the 1970s and 1980s, although he continues to write aphoristic, witty, and insightful psychoanalytic papers to this day. He has written an excellent review of the transition from Sullivan’s work to Interpersonal Psychoanalysis (Levenson, 1992), an article that can be faulted only for doing too little to illuminate Levenson’s own contribution. Levenson’s thinking of the 1970s and 1980s can be summarized in a phrase that Stephen Mitchell once used: “You can’t not interact”. That is, the analyst and the patient are each unconsciously involved with the other at all times. Unconscious, inevitable, and continuous reciprocal influence between patient and analyst becomes the touchstone of the psychoanalytic process. This point, which is not Sullivan’s, but which Levenson developed from his immersion in Sullivan’s work, then became the heart of the Relational critique. And so, looking back across the years, we can say that Sullivan’s thinking made possible both Interpersonal Psychoanalysis and (along with the ideas of Winnicott, Fairbairn, and Kohut) Relational Psychoanalysis. I summarize all these developments in order to shed light on the nature of Marco Conci’s contribution and achievement in this book. Sullivan’s life has been written about before, most notably by Helen Swick Perry (1982). The most significant part of Conci’s work goes beyond that, though. Conci does something new here: he discusses the use of Sullivan’s work in the psychoanalysis that came after him. No other book-length work on Sullivan addresses that subject. More than half of Conci’s book is devoted to Sullivan’s contemporary relevance. I have tried to introduce this subject in these brief remarks, but of course what I have said is only the slightest taste. Read Conci’s well-informed and substantial book to find out the substance of the matter. Marco Conci and I share a profound and abiding interest in Sullivan’s work. Perhaps I should call it a passion. I have been reading Sullivan for over 40 years; Conci has been at it nearly as long. And so in addition to my recognition of the scholarly and clinical value of this volume, I also have a deep, personal appreciation for it, and I recommend it to you. Donnel B. Stern, Ph. D.
Why a book on Harry Stack Sullivan? One could begin with the fact that there is no adequate Introduction to his work in monograph form1, although five of his seven books have been published in Italy by the publisher Feltrinelli (Milan) since 1961 (1961, 1962, 1965, 1967, and 1993)2 and works such as Conceptions of Modern Psychiatry and The Psychiatric Interview were certainly well received by the public3. Very little, if anything, is known about his life and the particulars of his life’s work4. My purpose with this book is to provide an Introduction to Sullivan’s life and work as well as to the context in which we can best place it. This book is the product of the desire to demonstrate his relevance for contemporary psychiatry, psychotherapy and psychoanalysis5. Helen Perry’s biography of Sullivan (1982) pursues a similar aim and thus represents one of the points of departure for my work. She depicts how the deeply penetrating insights of a poor student from the American countryside could lead to an adventurous, complex and ultimately successful interdisciplinary process of “consensual validation” and to the creation of a new perspective which ended up exercising an “enormous influence on modern American psychiatry and contemporary psychoanalytic thinking” (Greenberg and Mitchell, 1983, p. 80)6. The challenge I wish to chronicle in this book is to record the interdisciplinary path Sullivan developed as well as his interdisciplinary perspective, and to do so in an auto-didactic way similar to what he himself had done7. Simultaneously, the contemporary relevance of his work is best portrayed by reconstructing its decisive steps: from the psychotherapy of schizophrenia to his cooperation with the Chicago School of Sociology; from the formulation of interpersonal theory to his contribution to the foundation of modern psychotherapy. I have certainly learned a great deal in the course of this journey, so much so that Sullivan’s ideas have shaped my own personal and professional development8. It goes without saying that I would not have been able to manage this challenge without the support of a list of colleagues, above all Lucio Pinkus and Pier Francesco Galli. Both share not only my sympathy for Sullivan and his interdisciplinary orientation, but also the conviction that it is more than worthwhile to properly illuminate the pioneering character of his work. On this basis, in 1987-1988 not only was I able to give a seminar for the Philosophy Department of the University of Venice entitled “H. S. Sullivan: the meeting of psychiatry and the social sciences”9, but the work I undertook there also found resonance in the leading Italian journal Psicoterapia e Scienze Umane10[Psychotherapy and the human sciences] which led to the Italian publication of another of Sullivan’s books, Schizophrenia as a Human Process11. The journal Psicoterapia e Scienze Umane (established by Galli in 1967) picked up the interdisciplinary structure of Psychiatry which had been established by Sullivan in 1938. We have Galli’s and Gaetano Benedetti’s efforts to thank for the dissemination of the interpersonal tradition in Italy12. In addition, it was Galli more than anyone else who endeavored to explain and circulate Sullivan’s views13. These views still play a central role via his trenchant and inspiring contributions to debates in psychiatry, psychotherapy and psychoanalysis in Italy14. What can one say at this point about the reception of Sullivan’s work in Italy? First, that the interpersonal tradition he established, even if based (as was mentioned in one of the preceding footnotes) upon books which were published many years ago, “never had an institutional growth such as to reify it, but remained free of this and indeed also free from sharing in possible new developments”, as I noted, along with my colleagues Dazzi and Mantovani, in the Introduction to the anthology La tradizione interpersonale. To put it another way, it is certainly true that Galli never thought about establishing an institute for interpersonal psychoanalysis, but limited himself to the dissemination of its methodological foundations and its interdisciplinary and dialogical orientation15. A similar orientation can also be found in the presentation of Sullivan’s work by Gaetano Benedetti in 1961 in his Preface to the Italian edition of Conceptions of Modern Psychiatry16 as well as in that by Enzo Codignola (1930-1977) for the Italian translation of The Psychiatric Interview17. Unfortunately Codignola’s wish that Sullivan’s work would lead to a “reorientation of Italian psychiatry” did not come to pass. In this regard the interpersonal tradition really did “remain free” (see above) – free in the sense of unused! In spite of the very positive responses his books met18 with, the “concrete application of sociological parameters in clinical psychiatry” which Codignola wished they could bring about did not actually take place19. I am thus convinced that the reappraisal of his work I conducted in the 1990s, which includes new biographical material, will alter and improve the reception his work received in the 1960s, which was greatly conditioned by the limits of the “new psychiatry” of that day20. During the course of the Venice Seminar, the idea of addressing the one-sided reception of Sullivan’s work in Italy steadily grew on me until it gave me the decisive push to write this book. To put it another way: what was largely ignored by our nuova psichiatria was the concrete and operative character of Sullivan’s perspective conveyed by Patrick Mullahy with the following words: “The psychiatrist, if he is to function with social effectiveness, can no longer stand aloof. He must, while maintaining his own specialty [emphasis added], join hands with the other social scientists. This broader point of view requires a new orientation and the perfection of new techniques” (Mullahy, 1945; 1953, p. 294). What our nuova psichiatria had missed about his legacy was the necessity for us to remain clinicians, and not to give up our technical role instead of denying it, as Basaglia and his followers ended up by doing, for the sake of the mentally ill.
Gaetano Benedetti, with whom I supervised my first analytic cases21, has actively and consistently pursued a similarly integrative and interdisciplinary line. Like Sullivan, Benedetti has always remained true to his dynamic identity as psychiatrist, psychotherapist and psychoanalyst. This multifarious identity depends on the dialectical view which characterizes both his contact with patients and his considerable and stimulating scientific production22. Sullivan’s orientation is reflected in an entire series of Benedetti’s writings on the essence of our discipline and our professional identity such as his 1970 “Psicologia e società” [Psychology and society]23 and his 1988 “L’identità dello psichiatra di fronte all’evoluzione culturale della psichiatria” [The identity of the psychiatrist in view of the cultural development of psychiatry]. In the latter of these two texts, Benedetti emphasizes the merits and limits of anti-psychiatry and expresses the desire that psychiatry move toward a psychodynamic basis characterized by a dialectical vision of the variables mind, brain, constitution and environment (1988, pp. 24-25)24. Indeed, this is the line followed by most contributions to the Eleventh Symposium on the Psychotherapy of Schizophrenia (held June 12-16, 1994, in Washington, DC) which addressed the theme of “Psychotherapy and Comprehensive Treatment”, a subject which Sullivan pioneered25. Finally, Johannes Cremerius (1918-2002)26 provided valuable assistance, including putting me in contact with international psychoanalytic circles, which in turn gave me the opportunity to research Sullivan’s legacy in depth. I am thinking here not only of the courses Cremerius gave in Milan as part of the Associazione di Studi Psicoanalitici and the opportunity to regularly exchange thoughts with him, but also of a whole series of his publications, including: “The meaning of dissidents for psychoanalysis”; “Ferenczi: ‘Confusion of tongues between adults and children. The language of tenderness and of passion’. Read again and critically revisited 50 years later”; “Looking for hidden traces. The ‘Psychoanalytic Movement’ and the misery of the Psychoanalytic Institution”27. With the second of these articles, Cremerius played an important role in the rediscovery of Sandor Ferenczi’s (1873-1933) legacy; interestingly, colleagues from the W. A. White Institute have recently been coming to grips with Ferenczi on account of his link to the interpersonal tradition (see, for example, Wolstein, 1989). I shall repeatedly return to this theme in this book. The interpersonal context in which my research into Sullivan’s work took place would naturally been incomplete were I not to mention my contact with the W. A. White Institute in New York (founded by Sullivan, Clara Thompson, Erich Fromm, Frieda Fromm-Reichmann and Janet and David Rioch in 1943) and the American Academy of Psychoanalysis28. These contacts made possible many discussions with a multitude of colleagues, thus allowing me insight into how Sullivan had influenced contemporary interpersonal psychoanalysis29. Furthermore, in this way I was able to complete that path of “consensual validation” necessary in order to integrate the new data I had acquired into a real conceptual framework30. Part of this complex approach was naturally also the contact with the Washington School of Psychiatry and the famous Chestnut Lodge Sanitarium which I visited in the summer of 199231. In the course of writing this book I also had the good fortune to get to know Stephen Mitchell (1946-2000), whereupon I made it my business to promote in Italy the relational perspective he established32. In addition, I also published the anthology La tradizione interpersonale (1997) in conjunction with Sergio Dazzi and Maria Luisa Montovani which, like this book, provides access to a clinical approach which we believe is still very productive33. If I have spent much time in delineating the foundations (components, context, etc.) upon which my book depends, I do so not only to explain why I wrote it, but to enable the reader to develop an initial idea of Sullivan’s perspective. In my opinion, the interpersonal perspective includes not only the requirement to contextualize34 one’s own work, but also to present oneself, that is, to explain the interpersonal experiences which have influenced one’s development and affected one’s point of view. On this topic, Sullivan wrote: “Any person is to a great degree a function of his past interpersonal history” (BR/1947, p. 216), and “Any people is an interlocking dynamic network of a great many contemporary persons” (ibidem)35. Since I have provided an overview of the content of the book and in so doing have hopefully stimulated the reader’s imagination and appetite about its content36, it should not be difficult at this juncture to do justice to the task of an Introduction by saying a few words about how this book is composed. Continuing in the same style, I shall continue to adhere closely to Sullivan and trace his path in the following chapters. 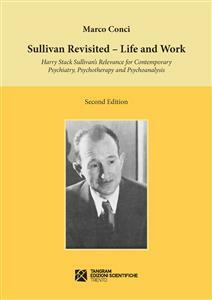 My study consists of two main parts: the historical and scientific context of Sullivan’s life and work and the contemporary relevance of Sullivan’s work. The first part comprises four chapters: “Psychotherapy takes hold in North America”; “Psychoanalysis in the ‘New World’”; “A life: Norwich, N. Y. (21 February, 1892) to Paris (14 January, 1949)”; “Sullivan’s work and the neo-Freudian turn”. The second part also comprises four chapters: “The psychotherapy of schizophrenia”; “Sullivan as social scientist”; “From Sullivan’s interpersonal theory to the clinical and psychotherapeutic dimensions of his work”; “From Sullivan’s ‘common psychotherapeutic language’ to Mitchell’s (1946-2000) relational psychoanalysis”. The titles of the individual chapters largely mirror the scheme of the paper I gave at the Ninth Symposium on the Psychotherapy of Schizophrenia (16 September, 1988). I also employed this same scheme in the Foreword to the Italian edition of Schizophrenia as a Human Process. As you may imagine, the care and attention to detail I employ in the first part to reconstruct the environment in which Sullivan was active serve the general purpose of this book: to definitively present his work in its entirety. I initially treat Sullivan’s importance to contemporary psychiatry, psychotherapy and psychoanalysis, to which I alluded in one of the footnotes above, as a whole and then discuss them separately in the second part. Finally, a word about the spirit of the times in which this book now appears, particularly as concerns the effect of Sullivan’s work on contemporary psychiatry. As Jean Garrabé has emphasized, the culture of DSM-III (and its revisions) is not only “atheoretical”, but also “ahistorical” (1992, p. 286). This can be seen in the fact that in the DSM-III handbook “only a few authors are cited (and then only incidentally) and their concepts are only partially presented” (ibidem). This has gone so far that today, in an age in which a “biological-reductionistic ideology dissolves the comprehensive and individual view of the person in a molecular fog” (Mondella, 1986, p. 4), one speaks of psychiatry as case management37. With Sullivan I would speak about psychiatric work in terms of “conducting an orchestra”, a work characterized by humanism, interdisciplinarity and the integrative vision which also characterize the interpersonal tradition he established38. I hope that proper involvement with his work will lead to a greater diffusion of this approach. (1)The chapter that Jay Greenberg and Stephen Mitchell dedicated to Sullivan must be regarded as the most successful of those in Object Relations in Psychoanalytic Theory, the classic which appeared in the USA in 1983 and has been available in Italian since 1986. (2)They all came out upon the initiative of Gaetano Benedetti and Pier Francesco Galli in the book series “Biblioteca di Psichiatria e Psicologia Clinica” [Library of psychiatry and clinical psychology] which they founded in 1961, with the aim of making the Italian public familiar with the most important foreign texts in the field of psychiatry and psychoanalysis. (3)In his Introduction to the ninth Italian edition (Feb. 1991), Pier Francesco Galli writes that, “The Psychiatric Interview, this synthesis of ‘able to be’ and ‘able to do’, has given much to Italian psychiatry”. (4)My Foreword to the Italian edition of Schizophrenia as a Human Process, which came out in 1993, should be understood as an attempt to improve this situation. (5)“The relevance of H. S. Sullivan for contemporary psychiatry and psychoanalysis” was the title of a lecture I gave (Conci, 1993e) at a conference entitled “Da H. S. Sullivan alla medicina psicosomatica” [From H. S. Sullivan to psychosomatic medicine] on 8 October, 1988 in Montecatini Terme which bespeaks the organization of this book. (6)In the Introduction to the Italian edition of his letters to his high-school friend Eduard Silberstein, I attempted to demonstrate how fruitful an analogous reading of Freud’s existential and professional path can be (Conci, 1991b). In my view, we are dealing here with the prototype of the writing cure which was eventually put into practice in the correspondence with Wilhelm Fliess and which represents the constitutive paradigm of psychoanalytic work. (7)As Giovanni Jervis attests in his book Fondamenti di psicologia dinamica [Fundamental elements of dynamic psychology] in the context of both university and medical specialty training “the theoretical study of psychoanalysis and its history is largely abandoned to the good will of a few students” (1993, p. 139). (8)It is clear that the relationship (analyzable as a transference), which develops in one who, such as myself, writes an “intellectual biography”, is worthy of its own treatise. The process of identification with the author about whom one is writing certainly represents a fundamental requirement and in my case – as indicated above – can be recognized once again in the auto-didactic character of Sullivan’s career. (9)I take particular pleasure at this juncture in naming the students who participated in this seminar: Mario Coglitore, Chiara Cordaro, Nicoletta Marchiori, Fabio Ponso and Patrizia Rumor. (10)By which is meant the article “I primi pionieristici scritti di H. S. Sullivan sulla psicoterapia della schizophrenia” [H. S. Sullivan’s first pioneering papers on the psychotherapy of schizophrenia] (Conci and Pinkus, 1989) and “H. S. Sullivan e il training dello psichiatra” [H. S. Sullivan and the training of the psychiatrist] (Conci, 1991a). (11)The Italian edition of Schizophrenia as a Human Process, excellently translated by David Mezzacapa who in the 1960s translated the first three of Sullivan’s books published by Feltrinelli, contributed to a revival of the reception of Sullivan’s work in Italy. (12)In addition to Sullivan’s work, the Italian publisher Feltrinelli, as part of Benedetti and Galli’s series “Biblioteca di Psichiatria e Psicologia Clinica” [Library of psychiatry and clinical psychology], also published Principles of Intensive Psychotherapy and Psychoanalysis and Psychotherapy by Frieda Fromm-Reichmann; Eating Disorders. Obesity, Anorexia Nervosa, and the Person WithinandThe Golden Cage. The Enigma of Anorexia Nervosa by Hilde Bruch; as well as Silvano Arieti’s valuable works Interpretation of Schizophrenia and Severe and Mild Depression. The Psychotherapeutic Approach, the latter being a collaborative work with his cousin Jules Bemporad. Bollati Boringhieri Press also made an important contribution in this direction. In addition to Clara Thompson’s Interpersonal Psychoanalysis I wish to make special reference to Harold Searles’ seminal books Collected Papers on Schizophrenia and Related Subjects, My Work with Borderline Patients and the more recent Countertransference and Related Subjects. As concerns further bibliographic information, consult my short outlines of the life and work of the authors. These appeared in the anthology I edited in 1997 with Sergio Dazzi and Maria Luisa Mantovani: La tradizione interpersonale [The interpersonal tradition]. (13)In addition to the already mentioned Introduction from 1991, I also wish to mention his Foreword to the Italian edition of The Interpersonal Theory of Psychiatry and the elucidation of Sullivan’s position given by Galli in December 1962 in Milan as part of the first Continuing Education course, which he had organized for his group. (14)In 1990, Galli wrote in this connection: “In consideration of the objectively diffuse nature of the psychotherapeutic function it is necessary that public health agencies consistently secure the expansion of ‘interpersonal psychiatric culture’ in order to guarantee space for the application of current psychotherapeutic knowledge” (1990b, p. 54). (15)This approach by Galli can be recognized in a contribution dated 1964 entitled “Psicoterapia e scienza” [Psychotherapy and science] which refers to an aspect I believe to be essential also in Sullivan’s striking line of research, that is, the problem of psychotherapy as a science. This situation started changing only in the 1990s, through the foundation of two interpersonally oriented institutes, one in Florence and one in Bologna. (16)Benedetti writes, for example: “Sullivan brings something alive before our eyes, something that in other psychiatric systems sometimes appears like an anatomical model of the mind. Even Freud seems to me to have been prisoner to a rigid and abstract mechanism as compared to Sullivan’s dynamic phenomenology” (1961, p. XVIII). (17)“The Psychiatric Interview is less of a psychiatry book”, Codignola writes, “than a book about psychiatry… It is simultaneously a testimonial and a technical text…” (1967, p. VII). Additionally: “In the cultural situation of present-day Italy the translation of this book is of dual significance. On the one hand the book demonstrates the importance of integrating psychiatric work with psychological techniques in their concrete application… On the other hand, positivistic psychiatric positions are contested and the dualistic, ideological division of psychiatry and psychoanalysis (already today’s reality) is challenged along practical rather than polemical lines” (ibidem). He then continues as follows: “The focus of observation is consequently relocated from a single sick individual to a situation, namely to the relationship between physician and patient. This is the moment in which the social dimension enters the domain of psychiatry in a very practical way… In this respect Sullivan is the product of American culture: from G. H. Mead to Adolf Meyer, from the philosophical to the psychiatric roots of contemporary American ideas down to the present day” (ibidem, p. X). And here is Codignola’s conclusion: “The Psychiatric Interview should also be understood as a contribution to a new psychiatric education” (ibidem, p. XIV). (18)I have found a great many more colleagues who read Sullivan in the 1960s and who have told me what an important role his essays had on their development than, except in a few cases, written records of such a positive reception. (19)As concerns written evidence, a text by Stefano Mistura is particularly illuminating as regards the kind of reception Sullivan’s work received in Italy in the 1960s. The following text comes from a bibliographic guide he wrote which appeared in 1976 as a supplement to Fogli di Informazione, the journal of the anti-institutional movement. On the one hand we find talk of the “discovery of interpersonality” as “a great step forward in the history of contemporary psychiatry”, yet on the other hand the author did not understand the interdisciplinary orientation of Sullivan’s work and even asserted that Sullivan, “had never seriously engaged the problem of public psychiatric work in the USA”. Anyone who has read Schizophrenia as Human Process (papers published in the 1920s and 1930s) knows this is not the case. (20)Actually the nuova psichiatria lacked the foundations, that is to say the clinical and socio-psychological dimensions, whose assimilation is indispensable to understand the synthesis of these dimensions in Sullivan’s work. As a matter of fact, in the late 1980s Michel David, in the merciless voice of the foreign observer, discerned a link between the “theoretical weakness” of our nuova psichiatria and the “catastrophic material crisis in psychiatric hospitals”, as well as with the “brutal anti-psychoanalytic character” of Franco Basaglia’s (1924-1980) reform movement. David traces this back to “the lack of university training on Freud which was internalized by the masters of neuropsychiatry” (1989, p. 614). Today, after the systematic de-provincializing of our culture, which is propelled by an entire range of colleagues and institutions, these things are now different. (21)I refer here to the Associazione di Studi Psicoanalitici (ASP) in Milan which traces its roots back to the Centro Studi di Psicoterapia, an organization set up in the 1960s by Galli and which since 1989 has been part of the International Federation of Psychoanalytic Societies (IFPS) (see also Corsi Piacentini, 1990). (22)I had the opportunity to extensively develop this point of view in the Postscript to the last book of his to be translated into Italian from the German, La psicoterapia come sfida esistenziale [Psychotherapy as existential challenge]. (23)This paper, subtitled “Notes on the most recent international congress on psychotherapy”, is a very detailed elaboration of the most important points dealt with during the Eight International Congress on Psychotherapy (Milan, 25-29 August, 1970). Such a congress remains relevant not only on account of the complexity of the points of view, but also because of the detailed dialectic that developed between the various positions. (24)I had the good fortune to share and be able to develop this view with Augusto Ermentini, the director of the Department of Psychiatry at the University of Brescia, and to do so as part of the psychiatric training program we offered to the residents. As a matter of fact, my own psychiatric training at the Department of Psychiatry of the Catholic University in Rome directed by Leonardo Ancona also centered around the construction of a psychoanalytically oriented psychiatry. See the 1984 book by Ancona, Introduzione alla psichiatria [Introduction to psychiatry]. (25)This was also the point of view I advocated (Conci 1994e) which is central to this book. This congress, at which I had the opportunity to speak about Sullivan’s role in Italy and Europe (Conci 1994d), represented the final step on the way to writing this book, naturally in the sense of the complex process of “consensual validation” which went along with it. During the panel (organized and chaired by John Kafka) at which I gave the second of the papers mentioned, I had the special opportunity to discuss Sullivan’s legacy not only with Kafka, but also with Robert Cohen (see his congress paper, 1994), a student of Sullivan’s, with Clarence Schulz (see, for example, Schulz and Kilgalen, 1969) and with Donald Burnham (see, for example, Burnham et al., 1969). After all, it was Benedetti who organized, with Hans-Christian Müller, the first of these important international symposia in Lausanne in 1956 (see also D’Alfonso, 1988). (26)If Benedetti’s and Cremerius’ teaching has captured such a wide audience in Italy this is probably because the Società Psicoanalitica Italiana (SPI) only very slowly established ties with international psychoanalysis. Arnaldo Noveletto has written about Eugenio Gaddini (1916-1985) that he “was the first in Italy to adapt [a] psychoanalytic institution (society regulations, meetings, journal, training) to the standards of the International Psychoanalytical Association (IPA)” (1992, p. 201). (27)It is not by coincidence that these papers, which were designed to address the need for a critical exchange with the history of psychoanalysis, all appeared in Psicoterapia e Scienze Umane, a journal whose thrust Galli described as follows: “The emotional history, the history of the conflicts which emerged in the history of psychiatry and psychotherapy is essential in our field. Seen from the perspective of the journal I run and its cultural orientation, history is not an option, nor an intellectual curiosity for the historian of psychiatry, but a fundamental criterion and a most essential component (1990, p. 214). (28)Since 1964 the White Institute, whose origin we shall address later, has published Contemporary Psychoanalysis, which is now also well-known in Italy. The American Academy (established 1956) publishes the Journal of the American Academy of Psychoanalysis whose first editor-in-chief was Silvano Arieti who served until his death in 1981 (see also Arieti, 1973). The establishment of the American Academy, as we shall see, can be traced back to the situation created in the 1940s by the series of splits within American psychoanalysis; it remains even today an important forum for collegial exchange. In Italy, the OPIFER (Organizzazione di Psicoanalisti Italiani – Federazione e Registro) fulfills a similar function. It was established in 1996 by Marco Bacciagaluppi along the same lines as the Academy; Bacciagaluppi along with Emilio Servadio (1904-1995) were the first Italian members of the American Academy. (29)In addition to Stephen Mitchell (1946-2000), whose personality and career I described in the Introduction to the Italian edition of Relational Concepts in Psychoanalysis. An Integration and whose early death was a great loss to our profession and our discipline, I wish here to recall the late Earl Witenberg. This student of Clara Thompson was director of the White Institute (see also Witenberg, 1994) as well as author of the first work on the interpersonal orientation in Italian (in Arieti’s 1969 Manuale di Psichiatria, the famous American Handbook of Psychiatry edited by Arieti) and editor of two important anthologies that included interpersonal papers (1973, 1978). I also received numerous interesting feed-backs from the late Gerald Chrzanowski, who in 1977 discussed Sullivan’s work in his book Interpersonal Approach to Psychoanalysis. Contemporary View of Harry Stack Sullivan, as well as from Edgar Levenson, who dealt with Sullivan in The Ambiguity of Change and in many other publications and is a brilliant representative of Sullivan’s perspective. Other colleagues I wish to recall and whose ideas are related to Sullivan’s are the late John Fiscalini and Alan Grey, who in 1992 edited a book on the interpersonal treatment of narcissistic patients, as well as the late Arthur Feiner, who in 1979 edited an important book on countertransference and was the editor of Contemporary Psychoanalysis for more than twenty years. Of all the colleagues of the White Institute, I also wish to mention Sondra Wilk, Miltiades Zaphiropoulos, Carola Mann, Irwin Hirsch, and Sandra Buechler with whom I also regularly had very stimulating exchanges of ideas. Last but not least, Zvi Lothane deserves a special mention for his precious advice and constant support. As concerns the multifarious ways in which Sullivan’s work has influenced contemporary interpersonal psychoanalysis, I refer the reader to the second part of this volume. (30)To my surprise I must declare that it is much easier to find advocates of Sullivan in relation to single aspects of his work: on psychoanalysis (at the White Institute), on psychotherapy (at the Washington School of Psychiatry) and on psychiatry (see the journal Psychiatry). Yet there are few comprehensive presentations such as Perry’s, for example, of Sullivan’s message in its interdisciplinary and integrative totality of the kind I have attempted with this book. I addressed this problem early in “Introduzione alla prima parte: origini e sviluppi” [Introduction to the first part: Origins and developments] in La tradizione interpersonale. (31)My thanks to Mauricio Cortina for the invitation to deliver a paper to the Washington School of Psychiatry on the subject of “H. S. Sullivan and the training of the psychiatrist” (Conci, 1993d English; 1993c Italian) as well as for introducing me to Kenneth Chatelaine (who published an important study of Sullivan’s in 1981) and Gloria Parloff, the former managing secretary of Psychiatry. I wish also to thank Sandra Colombo-Finzi (Milan & Washington D. C.) for the original contact to Chestnut Lodge Hospital, and the late David Feinsilver for his cooperation in making possible a visit. Anne-Louise Silver kept me later informed about the unfortunate developments which brought about the end of such a glorious institution. (32)In chapter eight I shall elucidate how this orientation was originally inspired by a systematic and creative exchange with Sullivan’s work. At this juncture I wish only to mention that relational psychoanalysis has had its own journal since 1991, Psychoanalytic Dialogues. A Journal of Relational Perspectives. (33)In fact, I too belong to the large group of Italians with a soft spot for the “New World”. Elio Vittorini was similarly fascinated when he published the anthology Americana in 1941 which, as Umberto Eco has written, was “not a history of American literature, but the construction of an allegory” (1992, p. 23). A very interesting contribution to this subject can be found in the anthology Immaginari a confronti [Fantasies in comparison], edited by Carlo Chiarenza and William Vance. (34)On an institutional and cultural level, in addition to the aforementioned IFPS there are two further associations which represent important benchmarks: the International Association for the History of Psychoanalysis (IAHP), founded in 1985 by Alain de Mijolla, and the Erich Fromm Society established by Rainer Funk also in 1985. As concerns the international professional literature, the journal History of Psychiatry, founded by German Berrios and Roy Porter in 1990, has breathed new life into the most recent historical work and joins the Journal of the History of the Behavioral Sciences which has been active since 1964. (35)The original context in which these sentences appeared can be found in the epigraph at the beginning of the first part of this book. (36)Freud spoke of “Erwartungsvorstellung” by which he meant a technique the analyst employs in his work with patients: he unleashes patients’ expectations, which gradually become part of a new conception of themselves and reality. The reader will have already noted that the footnotes are not essential to comprehend my intellectual itinerary in this book. This is true for the entire book. At any rate, Sullivan made frequent use of this technique, as also emerged from Lester Haven’s book Participant Observation (1976) which is devoted to his psychotherapeutic approach. (37)We are dealing here with that attitude which above all else draws upon a psycho-pharmacological monitoring and an entire series of further arrangements, external to an appropriate interpersonal relationship with the patient, which gained a foothold some years ago, not only in American psychiatry. That a disease such as depression, for example, represents a situation which requires a very sophisticated cultural and technical approach has been demonstrated by C. Bellantuono, E. Borgna, B. Callieri, P. Crepet, E. D’Agostino and M. Trevi in their book La cura dell’infelicità. Oltre il mito biologico della depressione [The treatment of depression – Beyond the biological myth of depression]. (38)“The psychiatrist is the leader of the treatment team primarily because he is most familiar with the biological, sociological, and psychological factors in human behavior”, John Neill (1980, p. 463) wrote about how Adolf Meyer (1866-1950) practiced psychiatry. Actually, Meyer and William Alanson White (1870-1937) wrote belong to the group of founders of American psychiatry that most strongly influenced Sullivan. Biography usually fails to integrate its subject person with the significant others who facilitated and handicapped his durable achievements as a contributor to cultural history, and rarely indicates whence came his skills and limitations in the interpersonal relations which made his contribution effective… The phenomenon of Freud without its setting in the contemporary society of Vienna has been followed by the phenomena of Freud’s evangelists and Freud’s detractors, also without sensitivity to the nuances of cultural differences within the major context of the Western world… Any person is to a great degree a function of his past interpersonal history, the immediate present, and the well- or ill-foreseen neighboring future. Any people is an interlocking dynamic network of a great many contemporary persons, each with past, present, and neighboring future with considerable identities and similarities – roughly equaling the culture – and some significant differences (Sullivan, BR/1947, p. 216)39. As Henri Ellenberger (1905-1993) has taught us in The Discovery of the Unconscious. The History and Evolution of Dynamic Psychiatry, a unique book both for the wealth of research it contains and for its methodology, the social, cultural, and historical contexts, including the so-called Zeitgeist40, are naturally of fundamental significance, as are the personalities and the interpersonal relationships of the pioneers of dynamic psychiatry. For this reason, I begin this first chapter not by unfolding Sullivan’s life and the events that will condition his personality and work, but rather by describing the social atmosphere of the Progressive Era, paying particular attention to the emergence of modern American psychotherapy at the turn of the twentieth century41. Specifically, I trace this aspect through the work and influence exerted by William James (1842-1910), James J. Putnam (1848-1918) and Adolf Meyer (1866-1950). Their influence is indeed essential for understanding – as we will do in the second chapter – both the context in which Freud held his famous Five Lectures on Psychoanalysis at Clark University (in Worcester, Massachusetts) in September 1909 and the reception and further development of his work in the “New World”, especially in terms of the specifically American phenomenon of the good reception of psychoanalysis within psychiatry. The third chapter traces Sullivan’s life, and together these first three chapters facilitate focusing more easily on Sullivan’s fellow travelers, the so-called neo-Freudians, whom I will address in the fourth chapter. At this point I will end chapter four by turning to the role Sullivan played in the 1930s and 1940s in the American psychiatric and psychoanalytic scene, as well as the legacy of his writings in their entirety, for the most part published posthumously. The first step, then, is to attempt to understand how at the turn of the last century certain preconditions would develop in various fields of knowledge, and how the need for modern psychotherapy in American society as a whole came to be felt42. (39)This is the quote that Helen Perry selected from Sullivan’s review of Chrysatemum and the Sword, written by his friend Ruth Benedict (1889-1948). Perry used it for the Preface to her Sullivan biography (1982, p. XII), and I do the same, in homage to them both. (40)Henri Ellenberger writes: “It is impossible to understand the personality and work of Carl Gustav Jung without considering his Swiss background and his family” (1970, p. 658). According to the obituary written on Ellenberger by the Editorial Committee of the journal History of Psychiatry, Ellenberger’s work was “arguably the single most important text written to date in psychiatric history” (1993, p. 448). (41)It is within the Zeitgeist of the Progressive Era that not only this last phenomenon but also Sullivan’s own intellectual background and development – for instance, its clear expression in the progressive orientation of his journal Psychiatry – should be located. For more on key characteristics of this particular phase of American history, see, among others: Maldwyn A. Jones: The Limits of Liberty: American History, 1607-1980. It is worthwhile in this context to point out that Adolf Meyer’s as well as John Dewey’s (1859-1952) social engagement were greatly stimulated by their meeting with one of the protagonists of the “Progressive Era”, Jane Addams, who in 1899 founded Hull House, a social welfare center, in Chicago on South Halsted Street, in the middle of a neighborhood slum (see Jones, 1983, p. 328). Finally, what became set in this socio-political climate is not only this very American pragmatism, but also the initial positive reception of psychoanalysis in the United States. (42)The definition of the term “psychotherapy” that Umberto Galimberti proposes in his recent book Dizionario di psicologia [Dictionary of psychology] is to be recommended for its conciseness and efficacy. However, Galimberti fails to consider the historical dimension of the development, which, like Ellenberger (1970) I consider fundamentally important and which guides my own work. As Ellenberger writes in his Introduction: “In this way it will appear to the reader that the growth of psychoanalysis and of the newer dynamic systems was not so much a revolution as a gradual evolution from the first dynamic psychiatry to the newer ones” (1970, p. X). Nathan Hale, author of the classic Freud and the Americans: The Beginnings of Psychoanalysis in the United States, 1876-1917, was the first to have put the question “Where should a study of Freud in America begin?” (1971a, p. XIII). And thus, in contrast to other studies that preceded this one, Hale explored in quite an original way “the professional, social, and moral order that determined the American reception of psychoanalysis” (ibidem)43. Indeed, as Hale writes: “Without an analysis of the pre-Freudian order, the nature of Freud’s influence could not be determined” (ibidem, p. XII). In other words, rather than adopt the route inaugurated by Ernest Jones in his Freud biography, which was later adopted also by Shakow and Rapaport (1964) and Burnham (1967), Hale takes on a rigorously historical approach analogous to Ellenberger’s and provides us with two fundamental contributions. First, he clearly demonstrates the reasons for the continuity between psychoanalysis and the pre-existing American psychotherapy, admirably describing its genesis and development, which began within psychology, neurology, and psychiatry. Second, he elaborates the particular type of reception that Freud’s work encountered in North America, thereby decisively contributing to the field of studies that examines the reception of psychoanalysis in individual Western countries, culminating in 1989 with sociologist Edith Kurzweil’s The Freudians: A Comparative Perspective44. Thus Hale, within this conceptual framework, devotes ample space to the so-called Boston School. In 1832, Boston had welcomed Johann Gaspar Spurzheim (1776-1832) and had become a fertile field of dissemination for the phrenology developed by Spurzheim’s teacher Franz Joseph Gall (1758-1828)45. Here, according to Hale, in the capital of New England and spanning the years from 1885 to 1909, modern American psychotherapy began and gradually took on a specific shape. This goes far in explaining why in 1906 the entry “psychotherapy” is included in the Index Medicus (Hall 1971a, p. 146) and why Morton Prince (1854-1929) founded the Journal of Abnormal Psychology. In May 1909, this same Prince, together with Putnam and Boris Sidis (1868-1923), in front of the participants at the American Medical Association (AMA) meeting in New Haven, summed up for the first time the actual state of psychotherapy (ibidem, p. 147), which Ernest Jones (1879-1958) then echoed in a pioneering contribution on psychoanalysis46.